Communicate Easier. Engage Families Better. many ways your school, PTA or classroom communicates. Connect with anyone; keep contact details private. Manage groups in and outside school. Post, comment, private message; share photos, files, links. Home-school connections to support student learning. Enlist volunteers, take a poll, schedule conferences. Integrate calendars; create web link directories. Family engagement in a child’s learning at school is the most accurate predictor of their success. 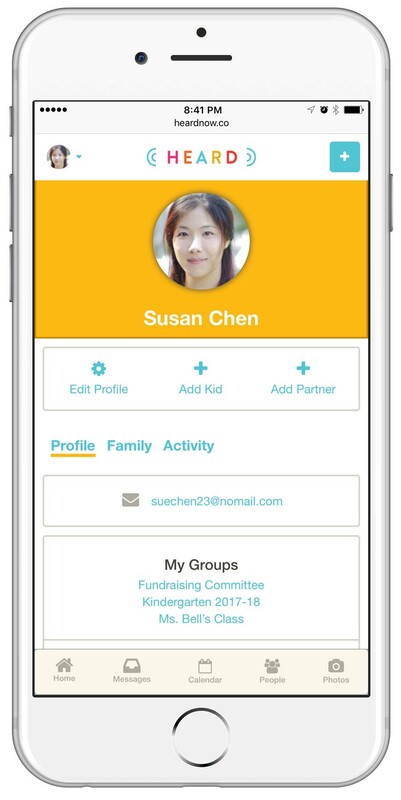 HEARD helps parents feel like partners, so they can engage. Two-way communication between school and families and among parents. Same access to features for all members. Ways to help teachers engage families in the learning. Whether it's two different schools, an aftercare program, or sports teams - manage it all from one place. HEARD is a private, invitation-only platform. Members control what information is public. a better way to communicate at school.